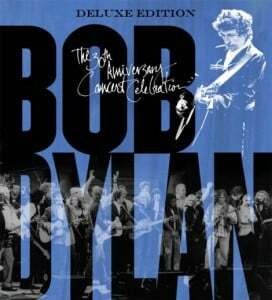 The Bob Dylan 30th Anniversary Concert at Madison Square Garden on October 16, 1992 could have been a last waltz. Instead it turned out to be rock & roll’s greatest half time show. Who could have imagined in 1992, three decades after Dylan’s first album and during a period when he was not writing any new songs, that the bard of Hibbing still had ahead of him the triumphs of Time Out of Mind, Love and Theft and Tempest, an acclaimed and best-selling memoir, an Oscar for “Best Song,” a radio show and a series of new number one albums? The great musicians who gathered in New York City to honor Dylan’s thirty years of recording were celebrating what was already one of the greatest careers in the history of American popular music. Beyond that the intention of the evening was ambiguous. There was no promise that Dylan himself was going to show up. No one in the audience knew exactly who was performing or what to expect. In that way the evening was very much in the spirit of the man being honored. 1992 was a good moment for the greats of rock, folk, blues, soul and country to convene. The Dylan tribute was coming out of the long season of Band Aid, Live Aid, Farm Aid, and the Amnesty International Conspiracy of Hope tours. We were getting used to gatherings of the rock gods for good causes. The Dylan 30th was not a charity event – that had to be explained to people over and over. It was a traditional buy-your-ticket-and-enjoy-the-show rock concert with an extraordinary lineup. From the opening act – John Mellencamp tearing through “Like a Rolling Stone” with the “Follow that” confidence of Jerry Lee Lewis setting his piano on fire – it was clear that every performer was going to swing for the fences. Everyone was bringing his or her A game. Chrissie Hynde sang “I Shall Be Released” with great beauty and control, selling every syllable. Among the background singers was an unknown Sheryl Crow. Johnny Winter took “Highway 61” to a Texas roadhouse (it wasn’t a long trip). Eric Clapton found the blues in “Don’t Think Twice” and the funk in “Love Minus Zero/No Limit.” Dylan had once offered Clapton a song called “Seven Days” which Clapton did not take him up on. Ron Wood, who was in the room at the time, grabbed the song for himself and made a strong case at the Garden for the tune as a lost gem. In fact, some of the great surprises of the concert were how different performers illuminated lesser-known Dylan songs. The O’Jays opened up “Emotionally Yours” in a way Dylan’s own version only hints at. Lou Reed made “Foot of Pride” sound like an outtake from his New York album. Willie Nelson drew out “What Was it You Wanted” until it felt like a dialog between a prophet and a disciple. In 1992 the legends were not that old. Dylan was 51. George Harrison, Eric Clapton and most of the vets were not yet fifty. Johnny Cash and Willie Nelson were a little older, but still in full command of their gifts. New kids like Tracy Chapman and Pearl Jam’s Eddie Vedder and Mike McCready were talented enough to command the spotlight even in such heavy company. Those young artists took on what might have seemed to be the most dated songs – “The Times They Are a-Changin’” and “Masters of War” – and proved that those fingers still needed pointing, those arguments were still unsettled. Stevie Wonder’s majestic “Blowin’ in the Wind” suggested how far America had come in its struggle for civil rights since both Dylan and Wonder began performing, while making clear that there were still many struggles ahead. Tom Petty and the Heartbreakers performed “License to Kill” like your best pal turning you on to an incredible song you might have overlooked and rollicked through “Rainy Day Women” like a gang of troublemakers being marched to the principal’s office. The Heartbreakers spent a couple of years touring with Dylan in the 1980s; their DNA was entwined. Roger McGuinn doing “Mr. Tambourine Man” was a beautiful moment of history revisited. Neil Young – maybe more than anyone – exuded pure joy in having a reason to stand in the spotlight and sing Bob Dylan songs. You knew that this was one musician who did not need a lyric sheet. Young inhabited “Just Like Tom Thumb’s Blues” from the inside. He had clearly spent a lot of hours lying on the floor with his head between the speakers listening to Highway 61 Revisited. When he went into “All Along the Watchtower” time stopped. Nobody sings Dylan like Dylan but if Dylan ever stops, Neil Young is next in line. The audience in the Garden that night was treated to one poignant performance that was lost to history because of a technical malfunction. When the hours of honors were over and Dylan took the stage alone, it was to sing “Song to Woody,” his 1962 tribute to his mentor, Woody Guthrie. It was a moment of humility and debts repaid. It’s a shame it was lost, but we have “It’s Alright, Ma,” “Girl from the North Country,” and the supergroup of all supergroups playing “My Back Pages.” Maybe there’s something appropriate about “Song for Woody” having been only for the night, not for posterity. Sometimes you just had to be there. Aside from this concert, 1992 was a rare quiet moment in Bob Dylan’s career. He was in year three of a seven year sabbatical from releasing any new original material. He suggested in an interview that he might be done composing – the world had enough songs. No one knew what Dylan was thinking (no one has ever known that) but some of the musicians who assembled at the Garden must have figured the evening would be a valedictory. More than twenty years later we understand that on the memorable night when his friends and peers came together to pay tribute to him, Bob Dylan was not done at all. He was taking a breath and getting warmed up for Act Two. Circle the calendar for 2022. Bob Dylan’s 60th Anniversary Concert is right around the corner. John Mellencamp, who’s been covering “Like a Rolling Stone” in concert for years, bravely took on the Dylan classic early in the show and delivered a fairly faithful and altogether convincing cover featuring strong vocal help from Pat Peterson and Sue Medley. Joining Mellencamp and his excellent band for the event on organ was Al Kooper, reprising his prominent part from Dylan’s 1965 original, which was voted the best single of the last 25 years by Rolling Stone in 1988. Mellencamp – who’s been instrumental in the activities of Farm Aid, which Dylan helped inspire with his onstage comments at Live Aid, and who directed Dylan’s “Political World” video in 1989 – was also in fine form for rousing, bluesy “Leopard-skin Pill-box Hat” from 1966’s Blonde on Blonde. One of the obvious emotional highlights of the show was Stevie Wonder’s endlessly soulful rendition of “Blowin’ in the Wind,” a song Wonder brought to the Top Ten of the Pop and R&B charts back in 1966, three years after Peter, Paul & Mary first introduced it to the masses. As Wonder pointed out in his moving introduction, the message of “Blowin’ in the Wind” remains, sadly, one of enduring relevance. A contemporary folk standard originally recorded for 1962’s The Freewheelin’ Bob Dylan, the song found Wonder working his gospel-tinged magic alongside Booker T. Jones and The M.G.’s – the phenomenally adept house band for the show. Booker T. & The M.G.’s now features Jones on organ, Steve Cropper on guitar, Donald “Duck” Dunn on bass and Anton Fig, filling in for the late Al Jackson, on drums. The group enjoyed a run of instrumental hits in the sixties, including “Green Onions” and “Time Is Tight,” as well as serving as the legendary house band for countless Stax classics. The very able musical director of the show was G.E. Smith, longtime Saturday Night Live band leader and veteran Dylan guitarist. Also making a significant contribution to the proceedings was session drumming great Jim Keltner, who’s worked with The Traveling Wilburys and just about everybody else over the years. In a winning example of one ingenious lyricist honoring another, Lou Reed righteously rocked out on “Foot of Pride,” an obscure outtake from the 1983 Infidels album that Reed, like so many other less famous Bob Dylan fans, discovered on 1991’s The Bootleg Series (Vols. I-III) set. Hardly an obvious song choice, Reed’s “Foot of Pride” was a gutsy as well as a hard-rocking remainder of just how much depth there is to Bob Dylan’s body of work. The riveting acoustic rendition of “Masters of War,” by Pearl Jam’s Eddie Vedder and Mike McCready, was arguably the evening’s most pleasant surprise. These two young Dylan fans didn’t need any loud Seattle sonics to get across Dylan’s pointed protest classic from The Freewheelin’ Bob Dylan. Vedder, who blissfully watched rehearsals for the concert from the front row of a nearly empty Madison Square Garden, proved with his wonderfully intense interpretation that when it comes to a great song, there’s no such thing as a generation gap. Tracy Chapman – who helped bring folk music back to the forefront with her acclaimed 1988 debut album, and who has toured with Dylan occasionally in recent years – offered an eloquent and moving solo acoustic version of the often-covered “The Times They Are a-Changin’,” the title track of Dylan’s 1964 effort. In Chapman’s capable hands, the song’s power remains undimmed by time. Country and rockabilly legend Johnny Cash and Bob Dylan have a long history of mutual admiration for one another. They first met at the Newport Folk Festival in 1964, and went on to record a session together in Nashville in 1969. The normally T.V.-shy Dylan even appeared on a Cash television special taped at the Grand Ole Opry in 1969. Cash and Dylan’s duet on “Girl from the North Country” was featured on Dylan’s groundbreaking country-rock effort Nashville Skyline, for which Cash wrote the Grammy Award-winning liner notes. At the show, Cash and June Carter Cash, his wife and longtime musical partner, teamed up for a surprisingly celebratory, down-home version of “It Ain’t Me Babe,” a song from Another Side of Bob Dylan that Cash took up the charts in 1964, well before the Turtles turned it into a pop smash in 1965. Willie Nelson and Bob Dylan are clearly two kindred spirits. Recently the pair collaborated on “Heartland” from Nelson’s new Across the Borderline album, which also included a cover of Dylan’s “What Was it You Wanted” – a standout track from 1989’s Oh Mercy that Nelson performed for the first time at the event. Playing bass on this swampy and sly rendition was Don Was, who produced Across the Borderline as well as co-producing Dylan’s 1990 effort Under the Red Sky. Nelson and Was stuck around to back up Kris Kristofferson for his appropriately mellow version of “I’ll Be Your Baby Tonight,” the song from Dylan’s 1968 album John Wesley Harding. Kristofferson – one of the many gifted and literate young singer-songwriters of the sixties and seventies who faced daunting critical comparisons to Dylan – became friendly with Dylan on the set of Sam Peckinpah’s 1973 western film Pat Garrett and Billy the Kid, in which they both appeared. Even earlier, however, Kristofferson worked as the studio janitor during the famed Blonde on Blonde sessions. A monumental display of blues power came from veteran Texas guitar hero Johnny Winter, who threw down a furious deep-blues take on “Highway 61 Revisited,” which Winter first cut on his 1970 three-sided sophomore Columbia release, Second Winter. The guitar line-up of Winter, Steve Cropper and G.E. Smith was in fierce form for the song, living up to the spirit of the late Mike Bloomfield’s riffing on Dylan’s 1965 original. Ron Wood’s barn-burning version of “Seven Days” provided another of the evening’s most happy surprises. An unreleased rocker performed live by Dylan on 1976’s “Rolling Thunder Revue,” the song was subsequently recorded by Wood for his 1979 album Gimme Some Neck. With Heartbreaker Howie Epstein joining the house band on bass, the Stone alone, who has often played and recorded with Dylan over the years, came through with a great throaty vocal that was more than a little reminiscent of the song’s writer. Richie Havens, who in his early days played many of the same Greenwich Village folk haunts as Dylan, first cut “Just Like a Woman” for his Mixed Bag album back in 1967. He’s subsequently recorded and performed numerous Dylan songs, some of which can be heard on his 1987 collection Richie Havens Sings the Beatles and Dylan. His solo acoustic version of the song at the celebration was a powerful testament to his abilities as a distinctive interpretive singer. Arguably the foremost Irish folk singers in the world, The Clancy Brothers from Carrick-on-Suir in the county Tipperary were already a famous group during Dylan’s early folkie days. For the Dylan show, they were joined by their longtime musical associate and special guest Tommy Makem as well as their nephew Robbie O’Connell for a haunting traditional take on “When the Ship Comes In,” a stirring ballad which first appeared on The Times They Are a-Changin’ album. The Brothers flew in from Ireland specifically to play the show. Rosanne Cash, Mary-Chapin Carpenter and Shawn Colvin – a trio of the most gifted women singer-songwriters around and major Bob Dylan fans all – teamed up to trade off verses for a gorgeous, harmony-drenched cover of “You Ain’t Goin’ Nowhere,” a Basement Tapes gem that was re-recorded by Dylan with Happy Traum for 1972’s Bob Dylan’s Greatest Hits, Vol. II set, as well as being a standout cut on The Byrds’ 1968 classic Sweetheart of the Rodeo album. Another kindred spirit and inspired party guest who turned in a great performance at the celebration was Neil Young, who somehow transformed The M.G.’s and drumming ace Jim Keltner into a fantastically loose, Crazy Horse-styled outfit for a strong reading of “Just Like Tom Thumb’s Blues” from Highway 61 Revisited, and an extended, fiery version of “All Along the Watchtower” that borrowed some of its kinetic power from Jimi Hendrix’s famed reworking of the John Wesley Harding song. Everyone from Sting to Bette Midler to the Heptones has covered “I Shall Be Released,” but Chrissie Hynde, the gifted Pretenders auteur, managed to make the song her own with a radiant performance at the Dylan event, featuring some prominent keyboard assistance from Paul Shaffer. The song was part of the famed Basement Tapes, written and casually recorded with The Band at Big Pink in Woodstock in 1967, and subsequently covered by The Band for its extraordinary 1968 debut album. The traditionally show-stopping Eric Clapton, who performed a duet with Dylan on “Sign Language” from his No Reason to Cry album in 1976, came through with a startling and moving performance at the celebration. The highlight of his set – which also included a luminous “Love Minus Zero/No Limit” – was a truly revelatory rendition of “Don’t Think Twice, It’s All Right,” from The Freewheelin’ Bob Dylan, that Clapton and Booker T. Jones radically rearranged into a seductive new bluesy masterpiece, complete with some incendiary soloing from the guitar master himself. Famed for such seventies soul smashes as “Back Stabbers,” “Love Train” and “For the Love of Money,” The O’Jays had a Top Five R&B hit with “Emotionally Yours,” a delicate love song from 1985’s Empire Burlesque that the group recorded in two completely different arrangements on its 1990 Emotionally Yours album. Backed by a gospel choir featuring the great Cissy Houston, The O’Jays brought a churchly spirit to the festivities with their stately version of the song. The history of The Band is, of course, inextricably tied to that of Bob Dylan. It was only fitting, then, that the current incarnation of The Band – featuring original members Levon Helm, Rick Danko and Garth Hudson – came together for a fine loose-grooving version of “When I Paint My Masterpiece.” The song was originally recorded with Leon Russell on piano in 1971 for Bob Dylan’s Greatest Hits, Vol. II, the same year that it became a highlight of The Band’s album Cahoots. A fellow Traveling Wilbury and longtime friend, George Harrison goes way back with Dylan. Before their prominent Wilbury collaboration, Dylan and the then newly former Beatle co-wrote “I’d Have You Anytime” for Harrison’s All Things Must Pass, the 1970 album for which Harrison also recorded a version of Dylan’s “If Not For You.” For the celebration, Harrison returned to Madison Square Garden, site of the 1971 Concert for Bangladesh, and utterly charmed the crowd by delivering an exquisite, clearly loving rendition of “Absolutely Sweet Marie” from Blonde on Blonde. Tom Petty (another wildly talented Wilbury brother in good standing) and the eternally impressive Heartbreakers recorded and toured the world extensively with Dylan for a period during the mid-eighties. At the Dylan event, Petty & The Heartbreakers – guitarist Mike Campbell, keyboardist Benmont Tench, bassist Howie Epstein and drummer Stan Lynch – were in peak form, offering a totally inspired and subtle reading of “License to Kill,” an underappreciated number from Dylan’s 1983 Infidels album. Switching gears brilliantly, they tore into a wild rollicking rave-up performance of “Rainy Day Women #12 & 35,” from the Blonde on Blonde album, that brought the house down. As for the man of honor himself, Dylan began his own set with “Song to Woody,” a moving composition from his debut album that remains a gracious salute to Dylan’s own early influence, Woody Guthrie. Unfortunately, technical problems prevent the song’s inclusion here. Dylan followed with a wonderfully intense rendition of “It’s Alright, Ma (I’m Only Bleeding)” from Bringing It All Back Home, that served as a vivid reminder of his incomparable acoustic power. “My Back Pages,” originally from 1964’s Another Side of Bob Dylan, became a history-making group effort, with McGuinn, Petty, Young, Clapton, Dylan and Harrison all trading off the classic verses. Then “Knockin’ on Heaven’s Door” – the elegiac standard from the Pat Garrett and Billy the Kid soundtrack recently covered by Guns N’ Roses – brought all the evening’s players out for a memorable ensemble encore. Finally, after the television satellite feed was shut down, Bob Dylan generously returned to the stage for a lovely, understated version of “Girl from the North Country” that proved one more time what one man can do armed only with his voice, guitar and extraordinary songs. The Band appears courtesy of The Pyramid Record Group, Inc.
Sheryl Crow appears courtesy of A&M Records, Inc.